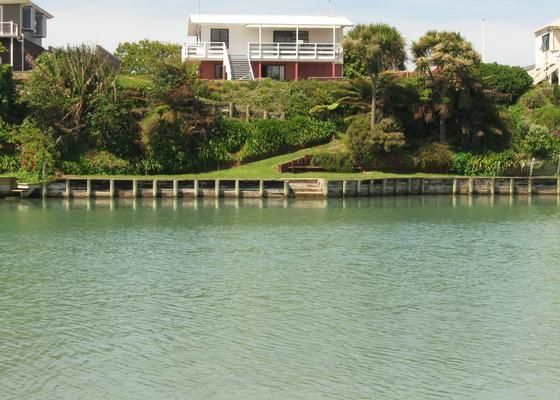 What a fabulous location on the waters edge, overlooking the aerodrome, Mount Karioi, harbour entrance and estuary from this upstairs holiday home. Within a five minute walking distance to the local corner store and approx 15 minute flat walk to the main street of Raglan, cruising through the local camping ground with its safe swimming beach. Comes with its own private jetty - which is ideal to launch your kayaks from or borrow ours. Try your hand at floundering - light and spears are available for those more adventurous. Children's playground just around the corner - great place for the kids to hang out during their holiday time in Raglan. Take in the view from the large deck that faces the sea and the sun, which is perfect for outdoor dining or entertaining. This property is the ideal location to relax and chill out in, and enjoy the summer days and offers all the comforts of home. The property is completely self contained however there is a couple who live in the downstairs unit permanently. Please be aware that vacate time is 10am on day of departure and 1pm on day of arrival. You are invited to check out my other listings. The bach is situated upstairs - so sorry not suitable for disabled access. Bach had a wonderful view of the estuary and airport. Bach had a wonderful view of the estuary and airport. Raglan is an awesome town. Awesome spot with a flat walk into town , we enjoyed our stay. Extremely happy with this location. yet so close to everything. The view is awesome from the deck. Great to be able to use the equipment, kayacks & p/board with life jackets. Our stay waking to bright morning sunshine, hot & bright, to stand near the stove & sink. Would be nice to have some netting or blinds. Unfortunately nil wash machine. Would be handy for couples with kids otherwise. Would definately be back for longer stay. Stunning location, couldn't ask for a better holiday spot. Stunning location, couldn't ask for a better holiday spot. Thank you so much!